I love these new BPA-Free 8-Piece Green Earth Food Storage Container/Nesting Set with Vacuum Seal and Locking Lids. There are so many nice things that I like about the containers. 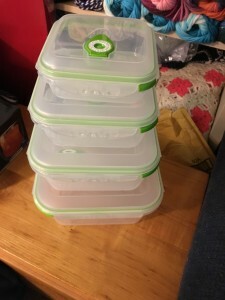 First is that they store inside each other – who has room for 4 containers in their cupboard? Not me – so see how nice they store? I love the different sizes – I know I will use them all. See the valve on the top? You just press down on the lid and the air is forced out through the one way valve. That removes all the excess air. The containers all so have a wavy pattern on the bottom so that holds the vegetables able the water. I love to prepare my veggies when I get home from the store and these containers work great for storing them. The big one I put lettuce in that I have washed and then dried in a salad spinner. I can’t believe how many days longer the lettuce stays fresh looking! The lids lock on tight – so no worries about the lid coming off and your food spilling out. Rex can even take them to work in his bag and not worry about leaking! There is also a date dial – so you can record when you put the food in the container. Now I know how fresh the items in the container are. The containers are BPA free, stain-resistant, shatter-proof and clear so you can see through them. These containers can be put in the freezer, microwave and dishwasher! They should last me a long time even though I use them all the time. 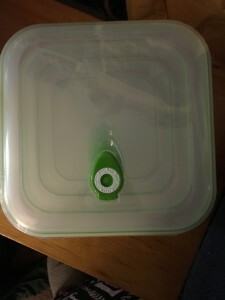 If you would like to purchase your own Green Earth Food Storage Container/Nesting Set with Vacuum Seal and Locking Lids you can find them on the link below from Amazon.com.